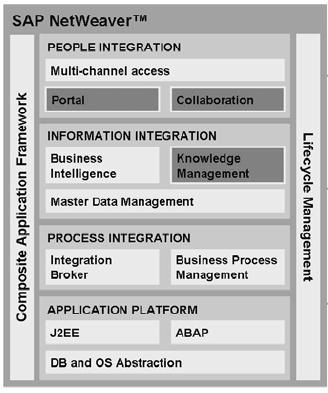 EP is People Integration in Netweaver stack. EP is mainly for browser enabling of various heterogeneous systems data. The Endusers of an organization like CEO, Manager, Vendor, Employee, Customer, Partner, Supplier, Dealer, Distributor etc will connect to portal server and portal server will connect to various heterogeneous systems. EP supports role based access to heterogeneous systems based on the roles and responsibilities of an Enduser of an organization. EP supports SSO (Single Sign On) Access to end users for connecting to heterogeneous systems based on roles and responsibilities of an end-user. SAP NetWeaver Portal offers a single point of access to SAP and non-SAP information sources, enterprise applications, information repositories, databases and services in and outside your organization—all integrated into a single user experience. It provides you the tools to manage and analyze this knowledge, and to share and collaborate on the basis of it. With its role-based content, and personalization features, the portal enables users—from employees and customers to partners and suppliers—to focus exclusively on data relevant to daily decision-making processes. SAP NetWeaver Portal is the Web UI for the newest generation of SAP enterprise applications, providing intuitive, Web-based access to HR, financial, customer relationship management, product lifecycle management, and other critical applications. As a unified interface to these applications, the portal helps each user quickly access the right resources and be as productive as possible.